Today nobody underestimates the power of Facebook. It’s a social network behemoth with over 500 million users and is the most trafficked website in the United States, overshadowing even Google. Your local Denver business can get a piece of the pie by having a business fanpage drawing thousands of people whose likes, interests and hobbies are a perfect match with your business. It is also a great way to publicize events such as sales, discounts, coupon codes, new products, videos, real live events (concerts, shows, seminars, customer appreciation events, etc). Above all you can use its advertising program to target people by their location, likes and interests. Facebook ads are the most cost effective advertising out there right now for small businesses. 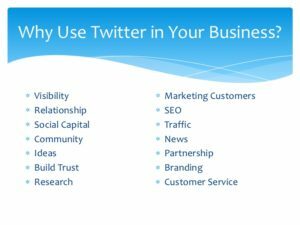 Despite being limited to the 140 character limit, Twitter is a great social medium to create a constant stream of information telling people about the latest happenings in your local business. Twitter is great for connecting you with other local businesses or even large brands you’re fond of. Is there a restaurant your employees frequent? A fellow 16th Street small business around the corner? It’s almost like instant messaging to a worldwide audience, yet local enough to draw people within a certain radius of your physical premises. Inserting links to your website or squeeze page can garner a lot of email opt-ins, if done right. Oh and in case you are wondering, yes Denver is a Twitter town. Twitter users are hungry for information. If you’re not providing it to them, someone else is, so the time to start tweeting is now. YouTube outranks all other video sharing sites with a 40% share of the gigantic 30 billion internet video content. It’s a good place to start with your video marketing. Over 50 percent of YouTube’s video views occur on mobile devices such as tablets and smartphones. In other words, when you think YouTube, think “mobile” along with it. By getting involved with Youtube, you are also connecting to your clients via mobile. The key to getting your site high Google rankings is to optimize your videos with keyword phrases in your title, description and tags and to encourage viral popularity of your video by encouraging viewers to click like or thumbs up. Also important to note is Denver businesses trying to reach millennials may want to pay special attention. Google research notes that YouTube reaches more viewers between the ages of 18 and 34 than any single cable network.